The Immigrant Youth Coalition (IYC) is an undocumented and queer/trans youth led organization that mobilizes youth, families and incarcerated people to end the criminalization of immigrants and people of color. The Immigrant Youth Coalition (IYC) is an undocumented and queer/trans youth led organization that mobilizes youth, families and incarcerated people to end the criminalization of immigrants and people of color. 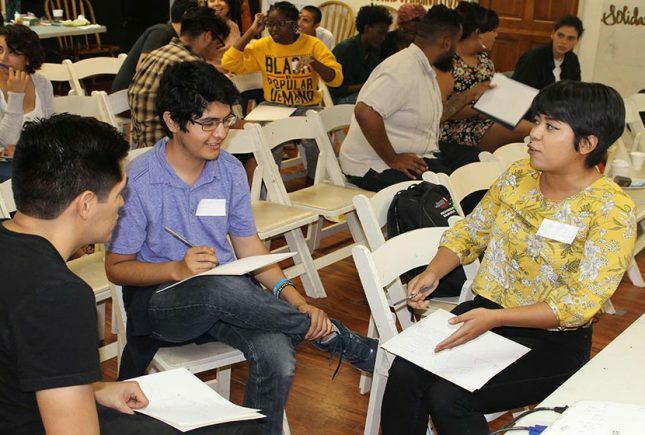 Through story-based strategies and grassroots organizing, IYC brings the struggles of directly impacted communities to the forefront of our movements to create social, cultural and policy change. Their programs and work build power with those directly impacted by approaching leadership development from a framework of human development which translates into their campaigns. IYC ensures that the undocumented and trans communities’ demands are included within the existing formations that are campaigning against immigration enforcement and mass incarceration. This organization is supported through the Funding Queerly Giving Circle, which is housed at Astraea.